Disc spring DIN 2093 made of stainless steel 1.4310 (AISI 301). 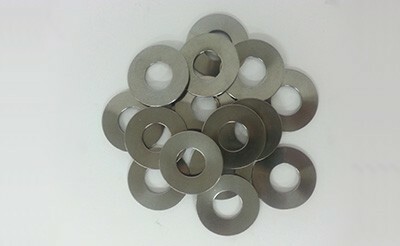 These springs are designed to dynamic works with good resistance to corrosion. The force differences depending on the measures made in standard material are because of the elasticity of the module of this material. The abbreviated chemical name of this material is X10CrNi18-8. This stainless steel is only used in pieces with thicknesses higher than 2/3 mm. The temperature range to work this stainless steel is from 200ºC to 100ºC.